Middle school mission: Description of a middle school. Describes characteristics for teachers, learning environments, students, and external community. A syllabus or outline to study how to facilitate thinking as a middle school classroom educator. Are attentive, cooperative, motivated, respectful, creative, engaged, aware of a larger world, think rationally and critically, express thoughts clearly, make good choices for physical, social, intellectual, emotional well being and development toward self-efficacy. Care about learning, desire to assist as members of an educational community to achieve middle level environments as described by research and best practices. Plan, implement, assess, monitor, and adjust instruction and classroom procedures to facilitate middle level student’s learning in a developmentally appropriate, positive caring manner that protects the dignity and meets the needs of diverse middle level students to learn and develop positive attitudes towards learning and self-efficacy for achieving and solving problems. Create and proactively manage middle level environments where students learn how to become productive members of democratic communities of learners who can self-monitor and set mastery oriented goals when making decisions. Decisions pertaining to academic study of core subjects to exploratory areas and topics, social skills, physical development, critical thinking and problem solving to build the knowledge, skills, and positive dispositions to become life long learners who understand, know how, and have the self-efficacy to continually develop their : physical, social, emotional, and neuropsychosocial abilities, individually and in groups, when given choices and not. Develop cooperative relationships with teachers, media and library specialists, special educators, parents, community members, and other agencies to promote student’s physical, social, emotional, and intellectual development in a manner that demonstrates respect for cultural, social, racial diversity and equity for all. Communicate professionally through oral and written reports student information, interpret meanings, possible explanations, and make recommendations for future actions to children, parents, and/or guardians, and other professionals and stake holders. Identify middle level students characteristics. Consider the unique characteristics of middle level students to enable them to achieve positive outcomes. Apply instructional strategies specific for middle level learners to achieve success. Evaluate curriculum for meeting the needs of middle level learners. Function competently in the middle level advising processes. Create appropriate interdisciplinary units of study for middle level learners. Apply authentic assessment practices using non-traditional methods such as portfolios and rubrics for middle level students. Analyze the developmental needs (social, emotional, cultural and academic) of middle level learners and create a classroom environment supportive of the needs of middle level learners. Collaborate as a contributing and supportive middle level team member. Use the five middle level goals for educators and use them as your personal goals or modify them for your needs. Then match activities to assess your abilities, investigate information to use to develop them as necessary, and document them for a professional portfolio. What makes an outstanding educational philosophy? What are the characteristics of middle level students? How are the educational needs of middle level students met? How to plan developmentally appropriate learning experiences for middle level students? How to implement instruction and learning to meet the needs of middle level students? How to assess and evaluate at the middle level? Print and Video Resources to investigate focus questions. Article: Learning Theory and Developmental Characteristics from Infant - Adult. Quick links to: 3rd- 5th grade and 6th grade (11) and up characteristics. Teaching in the Middle School. 4th edition. M. Lee Manning & Katherine T. Bucher. How Schools Kill Creativity. Animated video (11:40) titled:that uses edits from Sir Ken Robinson speech - School Kills Creativity: or Changing Educational Paradigms. Animated video (11:40) that uses edits from Sir Ken Robinson speech: Similiar to How Schools Kill Creativity with minor change. Activities to investigate focus questions. Focus questions to reflect on essentials of a strong educational philosophy and initial development of an educational philosophy. Map, web, or outline of the characteristics of young adolescents development and how the characteristics relate to appropriate teaching and guidance experiences. While it is important to understand each student is a unique individual and avoid stereotypes and biases. It is important to have a comprehensive understanding of the expected characteristics middle level students share. Realizing there is a wide range of abilities among students while at the same time knowing the common processes of learning and how different intellectual abilities develop over time. Map, web, or outline the characteristics of a high quality middle school education. Use your map to explain how and where ideas for the following are included: ideas from your educational philosophy, characteristics of middle level students, developmentally appropriate learning experiences are planned and implemented, students are continuously assessed, and managed in ways that meet their needs. 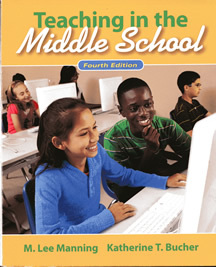 Middle level position paper or action plan that includes philosophy statements and other information consistent with the National Middle School Association keys to educating young adolescents. Clearly indicate your beliefs about middle level education and appropriate policies and procedures to implement as a professional middle level educator. Information on how to organize an action plan or position paper with sample philosophy, policy, and procedure statements. This will be a professional document to share with other educators, include in a portfolio, use for job interviews, and share with students and parents. Consider how to combine information into a small number of meaningful categories to make it more manageable and powerful. Curriculum planning. Begin 3-4 content maps to use in units of study. There are many levels of planning to faciliate student learning. Understanding Big ideas and general curriculum planning are prerequisite of specific planning with and for middle level students. Content maps focus on planning what students will learn (content) and how the information is best organized for teaching and learning. Planning what students will learn and how educators think and facilitate learning information and its relationships is critical. A content map or outline can be an essential first step, that is often skipped with an intent to save time, often at the educator's peril. The purpose of a content outline or map is to analyze, organize, and describe ideas for a selected topic. It identifies the necessary and sufficient information for students to learn and conditions to assist teachers to effectively facilitate student learning. Research suggests teachers who have a stronger depth and breadth of information are better able to assess on the fly, make better decisions to meet their students needs and increase their learning. Observations made by students for which initial information or ideas are derived to use as facts, ideas, concepts, generalizations … to reason with. Facts are information used to construct concepts and generalizations. Activities - opportunities for students to construct information about the topic or ideas. Opportunities to learn. Values - identify how students are going to use the information or the value it will provide by learning or conceptualizing it. Assessment - what outcome levels might students demonstrate with respect to the topic. Planning units to facilitate learning. Complete three unit plans alone or in groups: 1. Subject integrated, 2. Theme or topic integrated, & 3. World or life integrated. Units must be in electronic printable format. Include necessary information for teaching the Unit. Topic maps or outlines for the big ideas in each unit. Instructional models used for teaching each activity in the unit and activities sequence for at least five class periods of 90 minutes (block schedule). Describe formative and summative assessment in the activities procedures or assessment instruments and scoring guides with outcome levels. Background information for Creating all planning documents. Interdisciplinary Unit: Description of a School with an integrated curriculum that uses thematic studies. Information includes: School Prospectus, Curriculum, and Planning documents, how to plan thematic units with real life integration, and sample unit plan with the theme - water. Select and read a trade book for adolescent readers. After reading critique and describe how the book can be used for middle level students and include in one of your units. Source for what teens are reading: NPR 100 best ever teen novels. Professional educators consistently read current educational publications for professional development and to envigorate their zest for teaching. Select a current or classic educational book among these or one as significant. Read it and identify information that motivates you to want to take its ideas and use in a middle level education. Write or present a quality critique and recommendation of the book and how to use the ideas described. Critique includes, positive and negative rationale for each on how you would and wouldn't use. Be sure to include bibliographic information so anyone reading the critique can find it easily in a library and online. A book to study American History: Zinn relates our history through exciting stories that sometimes describe the appalling struggle for power in our country. NOT a long list of good guys who struggle with no one, which is neither our true story nor a good story. Stories with out struggle lead students to be passive and wait for the next exceptional leader, instead of becoming a force for change. Water. Who needs it and how can clean water be supplied to all people on Earth? Course to learn about Adolescent Health and Development Open source at Johns Hopkins Bloomberg School of Public Health. U.S. Department of Health and Human Services: Search under the term adolescent for health information. Block Scheduling a Solution or a Problem?